Overview At UNIQUEPROJECTS, we take our philosophy very seriously - we consider it to be the foundation for everything we do. Before we began the UNIQUEPROJECTS endeavor, we wondered if the concept as a whole was moral and sound. To this end, we analyzed many different components and ramifications of the idea. For those who may be interested, we have organized the results of our analysis into the following writings. Our mission is to provide a wide variety of distinctly unique project plans. Our ultimate goal is to inspire and facilitate our users to get involved with and create intriguing, high-quality items to live with and give as gifts. We aim to be an antidote to the disturbing trend toward consumerism, homogeneity and personal detachment. We are not seeking to merely distribute information related to handicrafts; rather we are trying to encourage and detail one deeply fulfilling process through which people can become engaged in their own lives. At UNIQUEPROJECTS, we are drawn toward fine design, but repelled by the arrogance that often accompanies it. We embrace attempts toward personal involvement but our society seems to be gripped by the trend toward disengagement. We are inspired by the innovative use of shapes, color, texture, light, lines and space, but bored by the increasingly significant role consumerism plays as the conduit between designer and end user. We deeply appreciate fine craftsmanship, but most of the things around us are coldly mass-produced. UNIQUEPROJECTS is our quiet attempt to address these discrepancies. Although there are many factors relevant to design decisions, they are often distilled into two simple categories: form and function. In most cases, designers determine the priorities of these two goals and create their designs accordingly. They usually try to accommodate both ends, but sometimes they are at odds with each other; a function must frequently be sacrificed for the sake of aesthetics or vice versa. At UNIQUEPROJECTS we are in the enviable position of being able to cast aside design projects that do not meet our stringent requirements, and therefore we are able to sidestep this need to prioritize. Since we are not commissioned to solve particular problems, we can focus on generating designs that meet all of our requirements. Our design considerations are (in alphabetical order): aesthetic appeal, availability of materials, availability of required tools, functionality, intrigue, safety of completed item, safety of process to make the item, uniqueness, etc. For us to post a project, it needs to satisfy all of these requirements, and if it cannot do so in a sufficient manner, we either modify or abandon it. Our pipeline of unique ideas is so large that we do not need to get caught up on solving a particular problem. The end result for our users, is access to only the highest quality unique projects. We figure that if you are going to spend the time, energy and emotion getting involved in a project, it might as well be unique and intriguing. The products available at most retail outlets seem to exude mediocrity: our goals are much higher. We aim to bring the most out of the materials we use, by using them in an interesting way that compels the user. Note that this is quite different from being flashy. You can put a coat of neon paint on any piece of furniture, for example, and it will get noticed, but that would not in the least be intriguing. But to add a feature or a function to a design or approach a problem from a different perspective, that is what injects vivacity and humanity into an item. What about style? Arts and Crafts, Bauhaus, Victorian? Frequently, the item itself calls for a particular style and we abide by that; but when it does not, we usually side with simplicity. Not necessarily because simplicity is always the most beautiful or because it is the easiest to make, but because we leave open certain elements of style to our users. After all, customizability is one of the primary reasons to make something yourself. Most of our users are adept enough to add style touches wherever desired. We include a design considerations section along with most projects so users can ensure that any changes or additions to a project will not affect its integrity. This discussion brings to mind a month-long camping experience I had in the Andaman Islands. I was situated in the jungle on the fringes of a beautiful and completely uninhabited white sand beach. After a few days it became clear that other than my hammock and the sand, there really wasn't a satisfying place to sit. 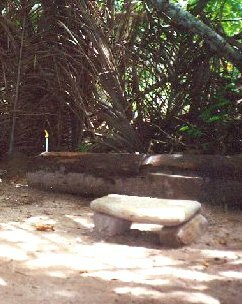 So I made of a simple stool out of three beachstones. Just three stones, but three stones that fit together beautifully and served a useful purpose. It gave me such a deep sense of satisfaction even when I was dozing off in my hammock looking at it from across the camp. This represents the epitome of design; the designed item seems to have existence and meaning beyond the mere material that it is made of. Much of this satisfaction is due to having gone through the process of selecting the stones and situating them in the perfect location. I wouldn't have traded that simple stone stool for anything. We hope that at least some of the projects that we provide can attain this status for our users. Making things yourself, is often cheaper than buying an off-the-shelf alternative. While mass-production reduces the per-unit manufacturing cost, the price a consumer pays includes profits for all of the links along the production chain (raw-material producer, shipper, OEM manufacturer, another shipper, manufacturer, another shipper, distributor, another shipper, retailer, deliverer). Factory-direct business models remove perhaps a few of these links but they are a far cry from the simplicity of making-it-yourself: you purchase or find the raw materials and beyond that you do the rest. You can customize the item to your needs and desires; you can include or remove features as desired. In our plans we describe the design considerations used in coming up with the idea; so if you want to make a variation we will give you the information necessary to ensure that it will be a viable one. You get involved in the gifts you give, or the things you live with. When you purchase, you are separated from the item; making items yourself yields a unique connection. As such, making things yourself is an antidote to the consumerism that seems to be plaguing our society. You can ensure that the item will be of heirloom quality. When you make something yourself you are in control of the entire production process. When you purchase an item you are putting your trust in a brand name that usually represents a distant manufacturing facility. Of course, there are high-quality manufactured products but these are often the minority and usually very expensive. Gifts that you make for others almost always have more meaning than those that you merely purchase. It is often said that the spirit of gift giving is not in the object itself but rather in the associated thoughtfulness. What gift is more thoughtful than one that is custom-made by you for the intended recipient? Such gifts indicate that you devoted some time and thought on a project to express an emotion or idea - therein lies true meaning. The process of making something yourself is intrinsically enjoyable. Furthermore this joy is often extended beyond the initial phase. Many make-it-yourselfers enjoy their projects forever because they feel a sort of connection to them. You can make truly unique things that are not available for purchase. While we offer plans for items that could be purchased, there will be at least something unique about them. We also provide items that are not available elsewhere and as such they are essentially unique. Things made by hand in the modern world of mass production are cherished. Engaging in a project with someone else is a great way to interact, not to mention that when you are done, you will have something to show for the time spent together. We encourage you to engage in a unique project with a friend or relative. We urge you to search through our project list, find a project that interests you and matches your abilities, get excited about it, customize the design if desired, and follow the steps to creating something unique. Before we began developing any project plans, we contemplated whether distributing them would contribute to and feed off of materialism; our mission is, after all, to show people how to make material things. To properly address this issue, we first need to 1) clarify what is meant by the term 'materialism', 2) determine if it actually is something that ought not to be sponsored, and 3) analyze whether our endeavor actually promotes it. The term 'materialism' refers to the excessive emphasis placed on physical things. Note that we are not using the term in its philosophical sense - that the cosmos is just made up of matter and devoid of separate spiritual or mental aspects. Materialism, then, resides at one end of the spectrum that designates our priority lists about different aspects of the world. An aesthetic who disregards all things physical and focuses attention to mental states or spiritual states would be categorized at the other extreme. It is not clear if there is room entirely off of the spectrum where there is no focus whatsoever be it physical, mental or spiritual. Perhaps materialism cannot even be placed on a spectrum at all, because it is a multidimensional issue. While these are interesting issues, they are tangential to the matter at hand. However materialism relates to other concepts, suffice it to say, that it is one's overemphasis on material things. With this working definition established, the obvious question arises: is materialism actually deleterious? Colloquially, the term does have a negative connotation. Interestingly, there is a less negative connotation for those that overemphasize their mental lives. One rarely hears a mathematician being chided as a 'mentalist'. But, what is wrong with being cold and rushing to your favorite blanket to subsequently revel in the beautiful sensation of warmth? Note that the definition we are using is over emphasis, and and such it is an issue of degree. While there may not be anything wrong with enjoying the comfort and warmth of a blanket, it could be considered negative if this enjoyment eclipsed other aspects of life. If the pleasure you obtain from certain physical things, comes at the expense of alternatives and prevented you from engaging in other activities, it seems relatively clear that they should be kept in check. This point becomes clearer when we consider something more frivolous like eating caviar. Again, while there may not be anything wrong with enjoying caviar, if one's obsession with it was to overshadow other aspects of life, this could be an example of materialism taking over one's life. Since sponsoring materialism ought to be avoided, we need to determine whether our endeavor sponsors it. Materialism is an issue of degree, namely, the over emphasis of material things: if UNIQUEPROJECTS does not overemphasize material things, then we would not be sponsoring materialism. Albeit, this is simplistic, but we never suggest that our users should drop out of religious organizations or cease involvement in academic work. So, in and of itself, project plan distribution does not contribute to materialism. We can gain the most insight into this matter by investigating where our focus actually lies. While most of our projects involve the making of physical things, our focus is not on the thing itself, but on the process of making those things. We focus on the project itself, the act of designing, preparing and executing a plan. The majority of our site includes information regarding the process of making an item, not information regarding the item itself. Although completed items are the end goal, it is the process of creating wherein the meaning and pleasure lies. The finished item serves as a reminder of the creator's involvement in its creation. Note that this endeavor is named 'UNIQUEPROJECTS' and not 'uniquethings'. Most likely, if you look around yourself right now, you will notice that most things were mass-produced. There are millions and millions of identical items. This strikes us as terribly bland and stripped of humanity. Although humans were undoubtedly involved in their design and production, those processes seem awfully distant. It is not feasible to make everything you may need and want, or even to have all of the items we use in life to be made by a craftsperson; however, if you make a few unique, high-quality projects, the items tend to rise above the mediocrity, and most importantly, the process is often deeply fulfilling.